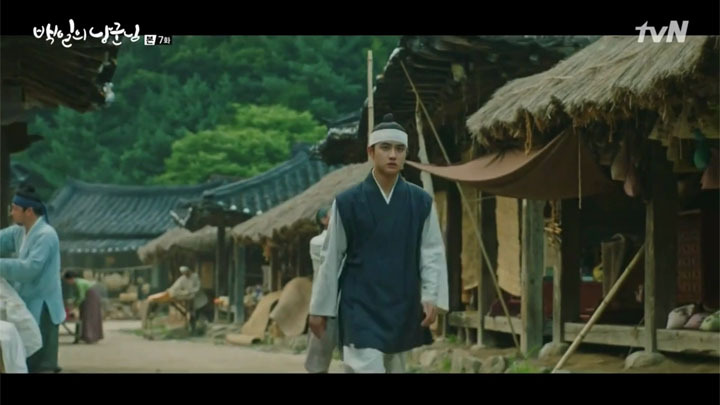 Following a thug, Won Deuk is brought to Park Sun Do’s place, where it’s confirmed the nobleman is behind the kidnapping. The report that the five thugs were sent running and that Won Deuk was no ordinary man has the nobleman so troubled by the fact, Park Sun Do decides Won Deuk must be arrested and killed somehow. He hadn’t come up with the offense that would allow him to do that until an arrow narrowly misses the nobleman as it passed him to land on the beam. 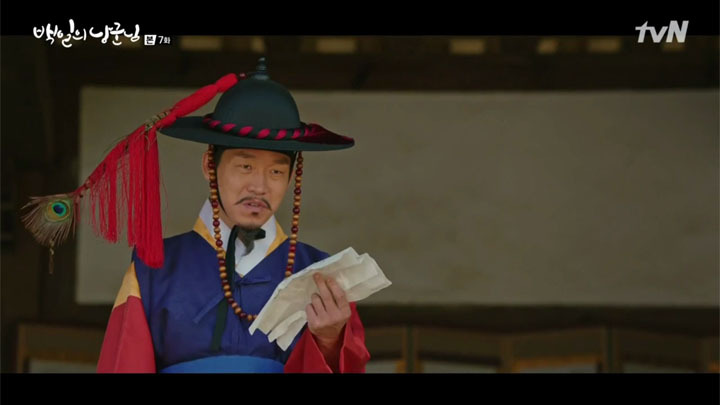 The arrow carried a note containing the poem Won Deuk had recited during the nobleman’s 60th birthday party. 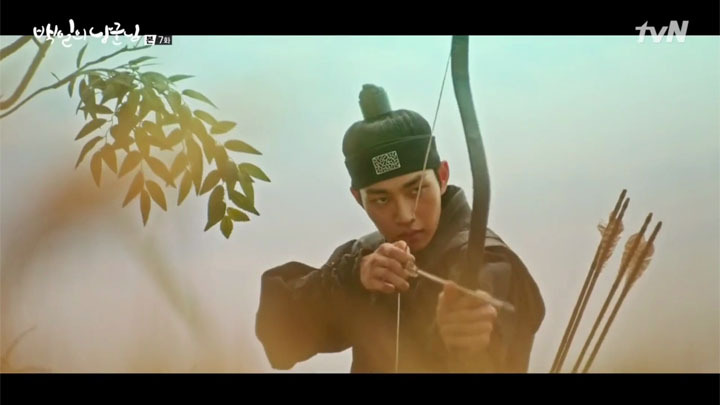 The shooter of the arrow is later revealed to be Heo Man Shik (Ahn Se Ha), the King’s Royal Inspector who had come to arrest the magistrate for corruption and bribery. The arrow looked to be a warning from the Royal Inspector that he was watching the magistrate. 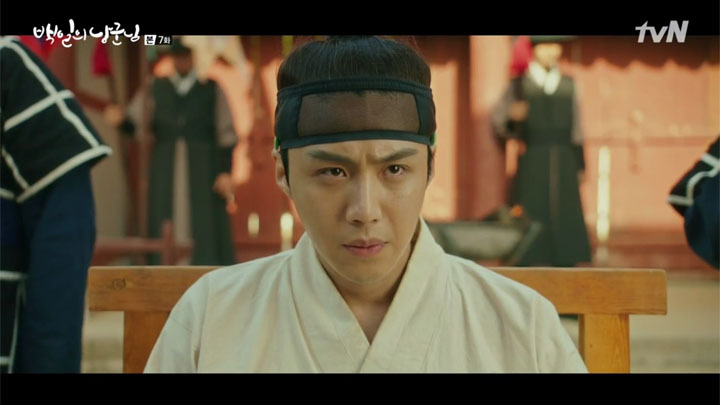 Park Sun Do didn’t care to confirm the shooter, though, and uses the incident to bring Won Deuk in for punishment. 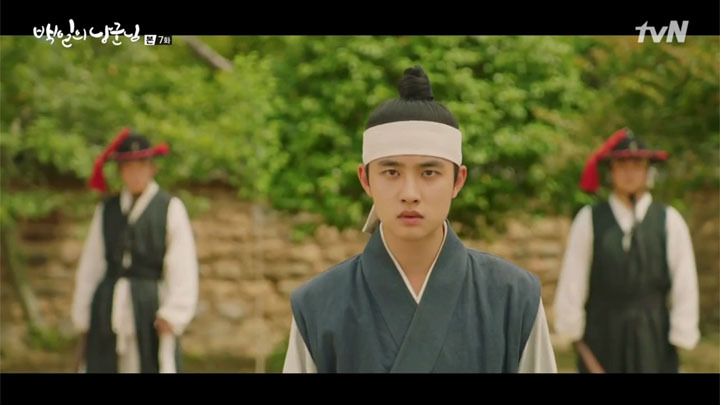 Hong Shim had come to try get Won Deuk released under the reason of Won Deuk being a fool, but Park Sun Do was not having any of it. 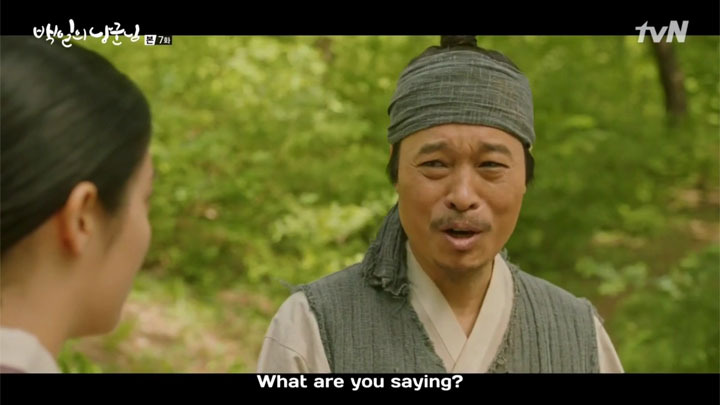 Won Deuk recited poetry and he heard he was a skilled fighter. He was no fool. Unwittingly, Park Sun Do just exposed himself to being behind Hong Shim’s kidnapping. No one should know about Won Deuk martial arts skills since it was never talked about. Hong Shim never told anyone about Won Deuk’s fighting skills and how he saved her. Her father, Gu Dol and her villager friends all think Won Deuk had run off and left Hong Shim to make her own escape. The nobleman could only know because he’s behind the kidnapping (which we know he is). Ignoring the accusation Won Deuk makes following this slip up and regardless of Hong Shim’s cries of ill treatment when Park Sun Do orders men to take Won Deuk away, Park Sun Do’s intent on having Won Deuk die or Hong Shim die. Park Sun Do tells Won Deuk to shoot an arrow to prove his innocence. 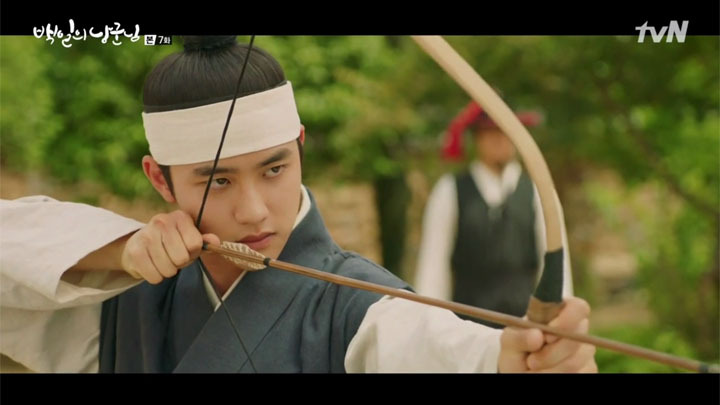 If he hits the target, he’s the perpetrator and Won Deuk will pay with his life. If he misses, he’s masking his skill, and Hong Shim will pay with her life. 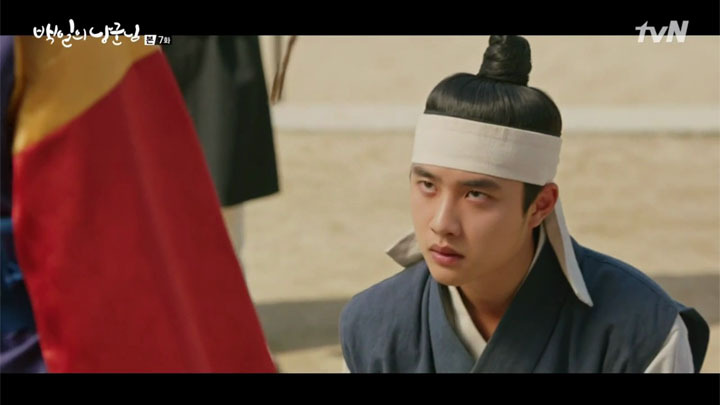 One way or another, Won Deuk will be punished. Fortunately for Won Deuk, he didn’t have to suffer either outcome. He gets saved by the King’s Royal Inspector Heo Man Shik, who arrives to arrest the corrupt magistrate who’s been using bribes to advance himself up the King’s court. This allowed Won Deuk to drag Hong Shim out of harm’s way following Won Deuk’s attempt to remove the sword that was aimed at Hong Shim’s neck, leading to calls for Won Deuk’s arrest again. In case anyone’s wondering, Won Deuk whether he hit the sword, the arrow did appear to hit the sword, but not without narrowly missing Hong Shim’s head. Won Deuk—or rather, Lee Yul—is a skillful archer and shouldn’t have had any problems hitting any target after Won Deuk discovered could shoot it, but his aim was weakened by another memory flashing before him. This time it was an arrow being shot at him during the ambush on Mount Chunwoo. With the discovery that Won Deuk is not only a skilled martial artist, but also a skilled archer, Hong Shim starts wondering just who Won Deuk is. No longer is she able to accept whatever her dad tells her about Won Deuk. She goes to her father wanting to hear the truth and be shown the truth by having her father take her to where he says Won Deuk is from. With her father unable to do that, Hong Shim’s father starts apologising. Whilst Hong Shim is suspecting Won Deuk isn’t who her dad says he is, Won Deuk is also suspecting Hong Shim isn’t who she says she is. When he asked about her to Gu Dol and his wife, he learns that she’s from another family, but that’s all was known. The fact she is from a noble family like her ability to read and occasional use of the Hanyang accent was suggesting—a fact Won Deuk had picked up—they seemed to have no idea. Leaving the Gu Dol’s place, Won Deuk gets spotted by Seok Ha whilst Won Deuk shops for shoes to give to Hong Shim. 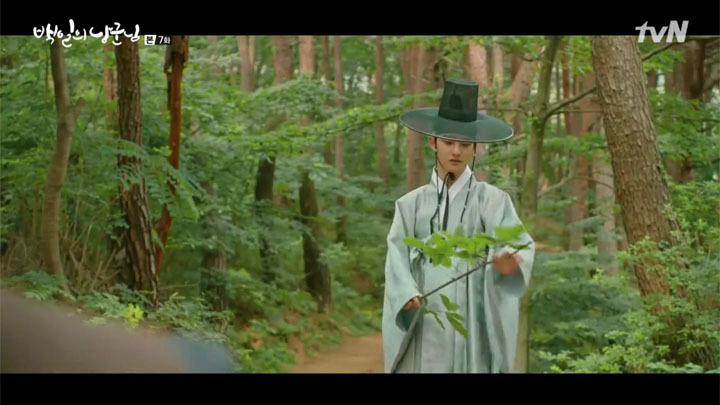 Following Won Deuk to the barley fields, he sets up his aim at the amnesiac Crown Prince and releases the arrow. 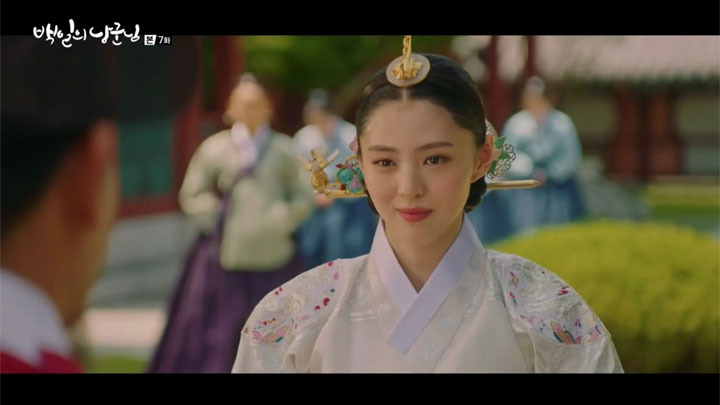 As the arrow hurtles towards Won Deuk, Hong Shim appears into view. Behind Seok Ha’s target is his sister! Over at the palace, the Vice Premier finally has the evidence to depose Queen and Prince Seo Won. 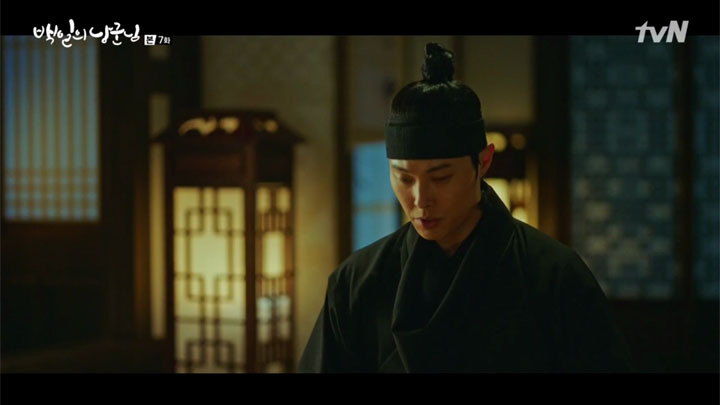 In an attempt to prove he isn’t involved in the Queen’s plans, Jung Jae Yoon finds the talisman the Queen denies any existence. 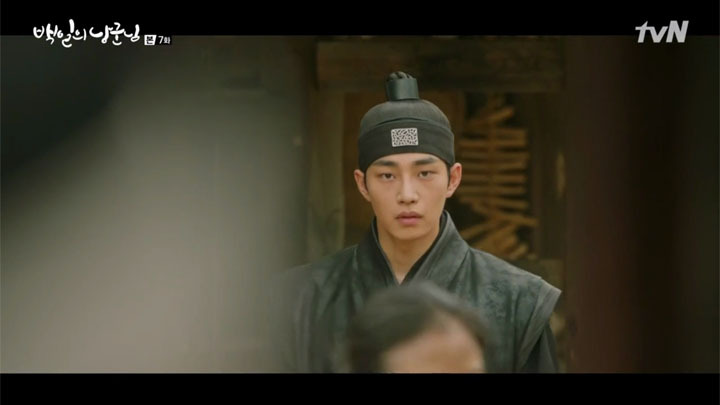 However, after Seo Won’s visit to the King, it has him decide not to make any decisions yet until they catch the real culprit behind the Crown Prince’s assassination. The King decides the talisman is an act deserving of punishment, but it doesn’t justify deposing. Such evidence is also not enough to prove the Queen’s involvement in the assassination either. 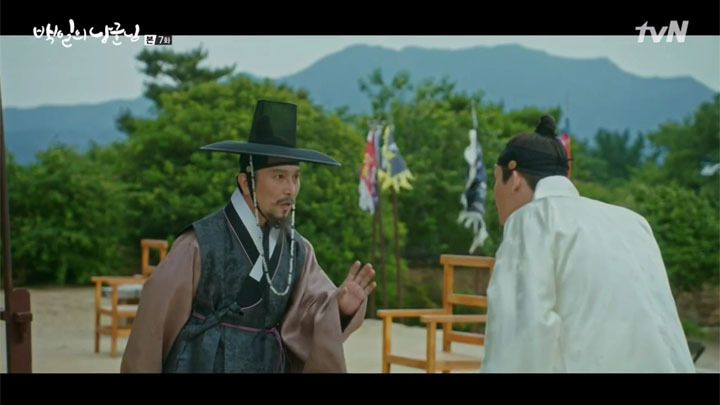 This has the Vice Premier question whether it was lack of trust the King had in him which is causing him to order Prince Seo Won and the Chief Censor to go to Mount Chunwoo to gather evidence which relate to the assassination. The King denies it, saying that he needed to consider the Crown Prince position. He couldn’t just depose Prince Seo Won so easily when he is his only heir alive. The King’s mention of Seo Won being the only heir gives the Vice Premier the perfect opportunity to announce the Crown Princess’ pregnancy. With the Crown Prince believed to be dead and the Crown Princess making good with her promise to kill the baby’s real father, the Vice Premier as well as the Crown Princess are now able to pass the baby off as the Crown Prince’s. Won Deuk’s totally useful status multiplies 10-fold. With just a twig he finds on a tree next to him, he shows the thugs just how much they aren’t his match, not even with five burly thugs welding wood and metal swords. And Hong Shim thought he was an idiot for taking them on instead of running. Won Deuk suffers a slash across the right arm when a memory of Seok Ha pointing his sword at him freezes him. Luckily, Hong Shim’s untied herself from the tree and manages to land a hit on the thug, and breaks Won Deuk out of his trance. Won Deuk finishes off the fight threatening death if they continue. They recognise they’ve been out-fought and make a run for it. Won Deuk’s mind is on chasing the thugs down. No way is he letting the people who threatened Hong Shim’s life go. Hong Shim, though, is eying that bloody arm of his. 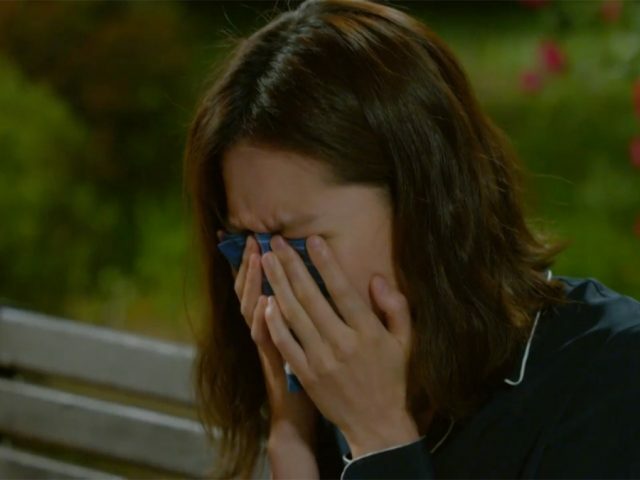 When Won Deuk only hangs around long enough to stop her from tearing her dress to bandage his arm, a hand lingers in the air as if wanting to call him back. 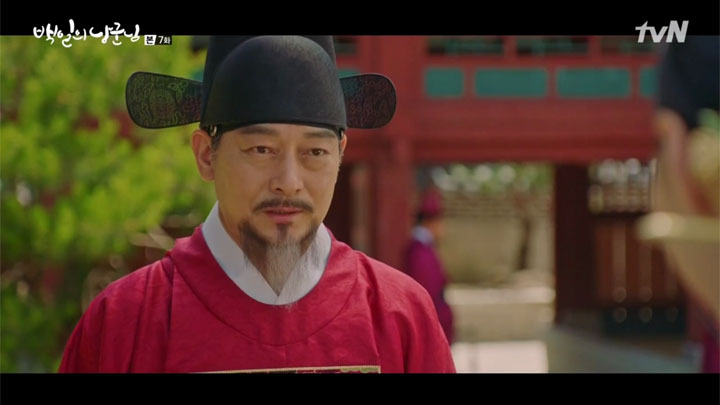 Jung Jae Yoon is detained for questioning for sneaking into the Crown Princess’ courtyard, along with the Queen’s courtlady. 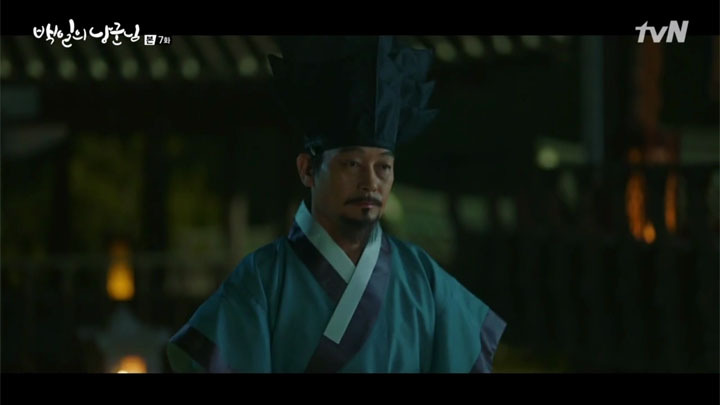 To protect the Queen and her use of talismans, Chief Censor Jung Sa Yeob (Choi Woong), Jung Jae Yoon’s half-brother, threw Jung Jae Yoon away to fend for himself. 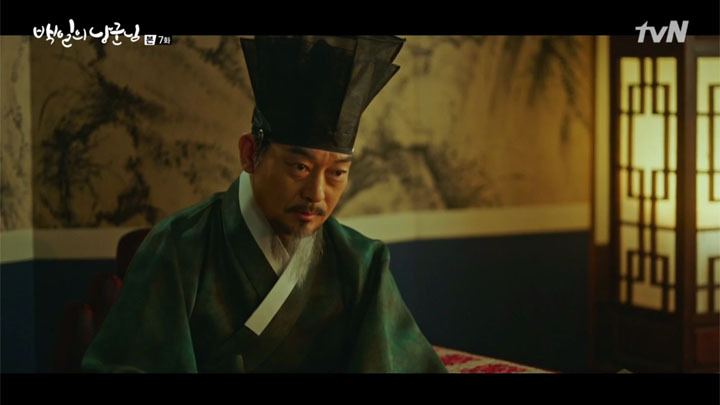 However, Jung Jae Yoon’s one smart, quick-witted man (Lee Yul had recognised this about him which is why Jung Jae Yoon was given the secret letter to solve) and finds the talisman the Queen denied using on the Crown Prince and Princess. 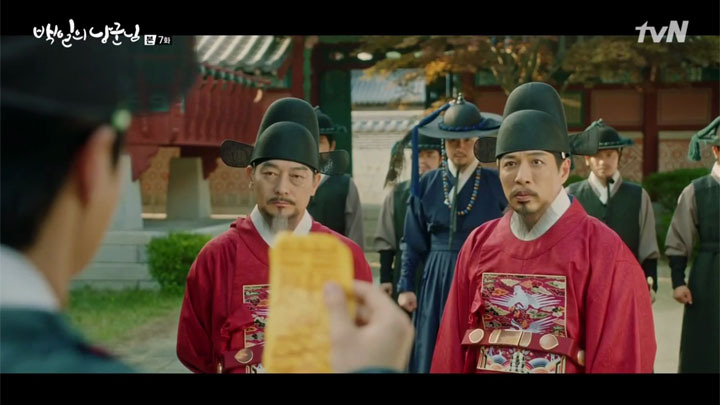 Rather than help Jung Jae Yoon, the locating of the talisman gets him in further trouble when the Vice Premier accuses him of concealing the talisman at the Crown Princess’ courtyard. Seok Ha learns that the girl who was captured by the thugs is his own sister. 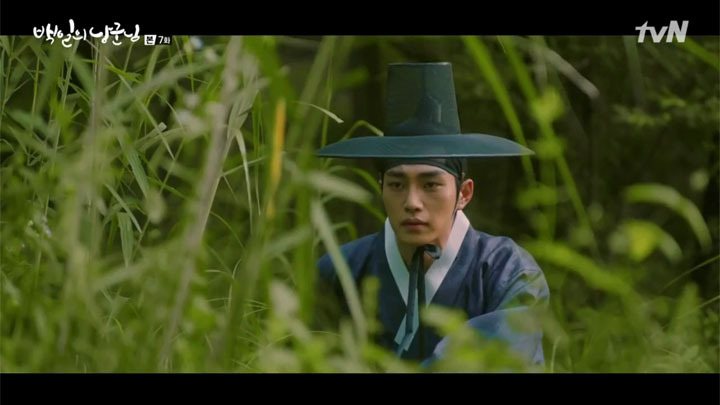 Whilst making his way into Songjoo Village, he saw Hong Shim’s father and Gu Dol speak about the kidnapping. Seeing the cherry blossom tree Hong Shim told him was on their front yard, he put two and two together, leading him to Hong Shim at the bottom of the mountain she was held hostage. Won Deuk’s trailing of the thug leads him to Park Sun Do’s place. The trashing of the house, the kidnapping was Park Sun Do’s doing and he’s got the magistrate working with him. Hong Shim is full of genuine worry for Won Deuk in this episode. 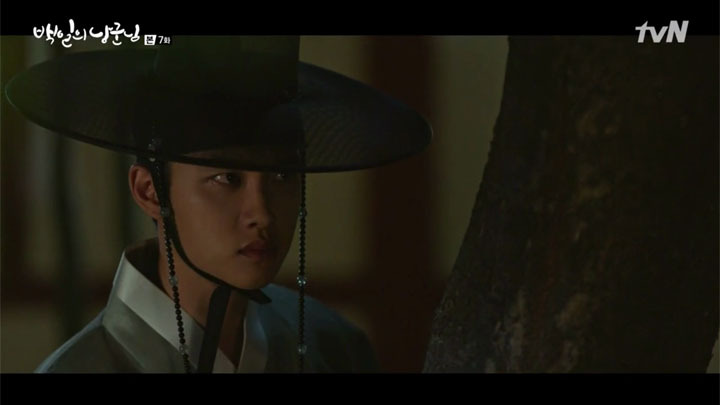 Hong Shim waits for Won Deuk under the moonlight like one does for her beloved. 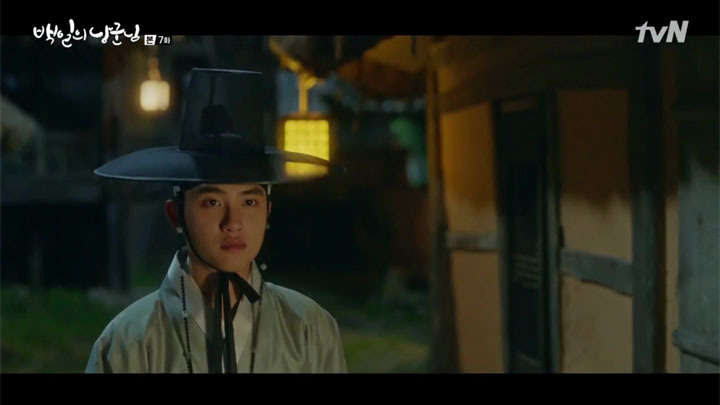 She’s so worried, before heading out onto the street to wait for Won Deuk, she was barely there whilst her villager friends sat talking at the pub. Hong Shim attentively cleans and bandages Won Deuk’s wound. As she is doing this, Won Deuk’s gaze catches the rope marks around her wrist and expresses he won’t let the men go until he punishes those who did this to her. This brings Hong Shim to tell him about the way society works: revenge is only for the powerful, not for people like them, people who aren’t recognized as people as only noble men and women are considered people. Won Deuk doesn’t promise anything with not going after powerful people. Instead, he tells her to not challenge stronger men because she doesn’t want her hurt. Hong Shim bows her head with feigned obedience, agreeing to listen to what he’s telling her. It’s a huge change from before she learned just how capable he is as a man and a husband. Before was just a workhorse to her and she often treated him with a dismissive attitude. Now there’s genuine concern and probably hidden respect for him as a very dependable, reliable man who actually has the ability to protect and care for her. Jung Jae Yoon’s meets up with a gisaeng, Ae Wol, to hand her the Crown Prince’s letter for safekeeping. It’s not really the Crown Prince’s letter. It’s a fake. He had planned this meeting knowing he would be followed by the Vice Premier’s men in an attempt to retrieve the letter Jung Jae Yoon denied Vice Premier from seeing. Following the failed attempt to save himself when he found the talisman, Jung Jae Yoon revealed to the Vice Premier the truth: he was at the Crown Princess’ courtyard because he was led there by an order given by the Crown Prince. Hong Shim stays the night with Won Deuk as he wants. She tried sneaking away whilst he was apparently half asleep, but he pulls her back in, convincing her to stay next to him because his arm throbbed and needed her to support his arm. Won Deuk eventually falls asleep while Hong Shim lay awake thinking about the kidnapping incident and Won Deuk’s exceptional fighting skills. 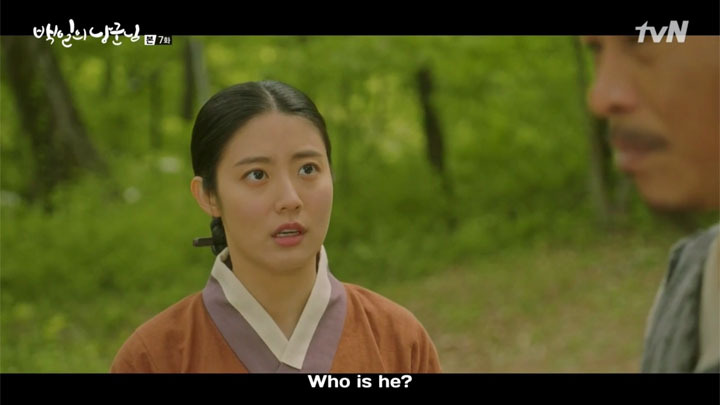 Hong Shim has questions about Won Deuk’s identity again and leaves to see her dad for answers only to find he’s not there. (He’s out digging up the uniform Lee Yul’s clothes from their house.) Hong Shim comes face to face with Heo Man Shik. In his hands grips a gold bar. He’s not just a villager. Seok Ha flashes back on the time he had no choice but to work the Vice Premier. He had gone after the Vice Premier and threatened to kill his daughter (the current Crown Princess) if he continues his search for his sister Yoon Yi Seo, but was unable to do it. He threatened to kill Vice Premier and charged at him, but was over powered and brought to his knees begging for his sister to be spared. Won Deuk heads out early in the morning on a mission to retrieve the book he spent all his and Hong Shim’s money on back in Episode 4. It turns out, this book is a ledger and what brought the corrupt magistrate down near the end of the episode. He doesn’t find it. Hong Shim’s gone and taken it and given it to Heo Man Shik. She’s figured out Heo Man Shik’s identity apparently through that brief scene where she sees him with a gold bar in his grasp. 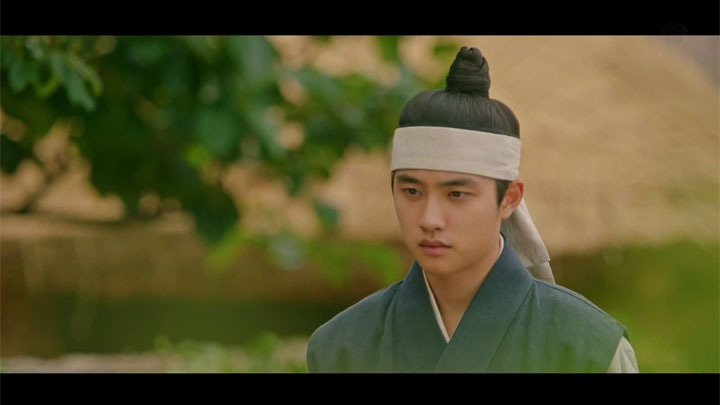 Park Sun Do calls the magistrate over early in the morning to come up with something to arrest Won Deuk over then kill him in a straw mat all because he feels unsettled about him. Conveniently, an arrow flies past Park Sun Do and lands on a pillar of his house. It’s not Won Deuk’s doing, but the contents of the letter—the poem Won Deuk recited at his birthday celebrations in Episode 5—is used as proof it’s Won Deuk who shot the arrow. The real shooter is actually Heo Man Shik. In the palace, the Vice Premier’s getting what he wants. 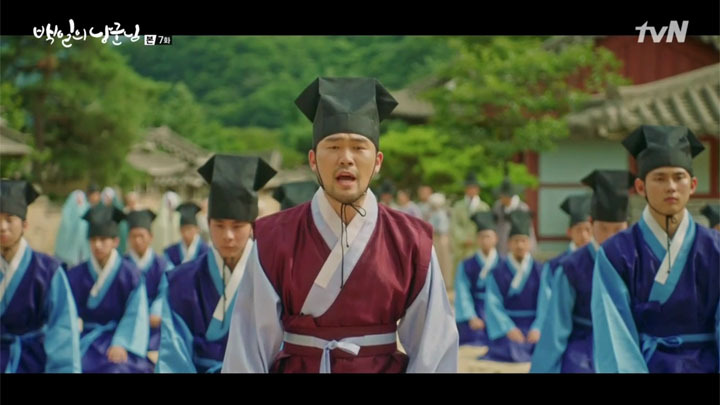 The scholars are all demanded the King depose the Queen and Prince Seo Won for use of talisman on the Crown Prince and Princess. Won Deuk’s arrested and brought to the magistrates office and made to shoot an arrow to prove his innocence. It’s a trap of course. Hit the target and Won Deuk is made the shooter of that arrow at Park Sun Do’s place. Miss the target and Won Deuk is seen to be hiding his skills and he will kill Hong Shim. Left with no choice, Won Deuk aims at the target at first but then turns it on the sword held against Hong Shim’s throat. 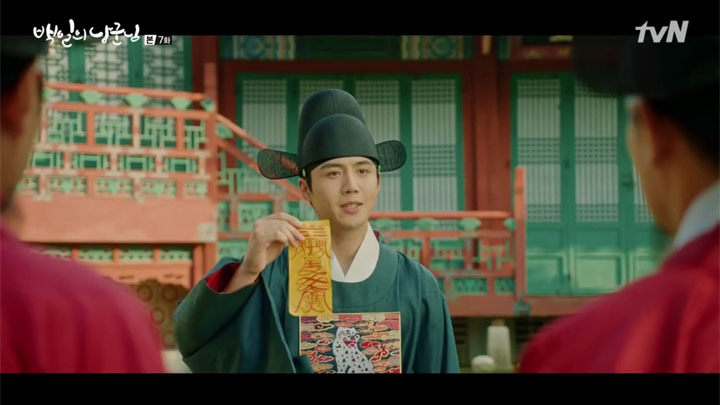 Heo Man Shik shows up with the ledger Won Deuk bought, right after Won Deuk dared to aim and shoot in the direction of a nobleman. Won Deuk is saved from being tied down and beaten. Won Deuk takes Hong Shim away with him. He apologises and hugs her for aiming the arrow at her. Here, he reveals to Hong Shim what reason made him try for the sword when he didn’t even know archery. A feeling came to him when he picked up the arrow. He suddenly had this feeling it was possible to get the sword away from her with his arrow. He also reveals that a memory came to him. That is why he lost his aim. Hong Shim asks what it was about. He doesn’t elaborate, only saying it could have been an illusion. Vice Premier’s told the father of the baby has been taken care of by the Crown Princess. With this confirmation, Vice Premier proceeds with revealing that the Crown Princess is pregnant with Lee Yul’s child while the Crown Princess reveals the news to the Queen. Won Deuk’s wondering what Hong Shim’s real identity is. She was able to read books (Episode 5), Hong Shim was able to know the book he bought was a ledger and she uses a Hanyang accent at times. Going to Gu Dol and Kkyeut Nyeo, he learns her dad is not her real dad and that she actually has another family. Her real family. Hong Shim wondering the same about Won Deuk, too. She runs into her dad which has her demand to know. 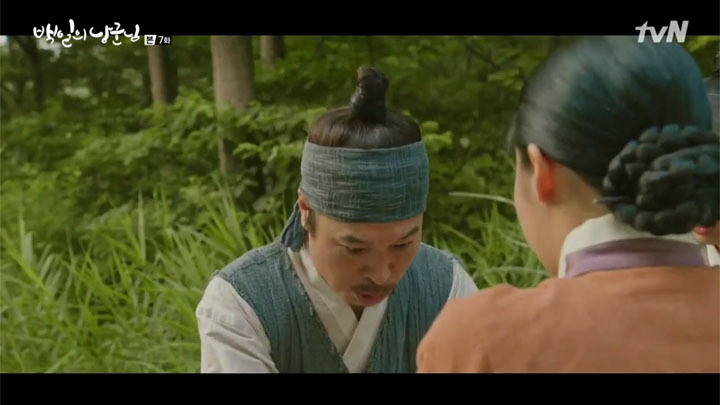 She reveals to him what she hid before: that, Won Deuk had saved her with a branch during the kidnapping incident. He also had great archery skills. Her dad tries to avoid answering, but Hong Shim wasn’t letting him off easily. She asks her dad to tell her where exactly he’s from and to lead the way then and there. Her dad’s answer to that is “sorry”. He’s looking to finally reveal the truth, but we don’t hear what he says exact (not till next episode). Seok Ha’s found the Crown Prince aka Won Deuk! He’s been following clues over the last two days. 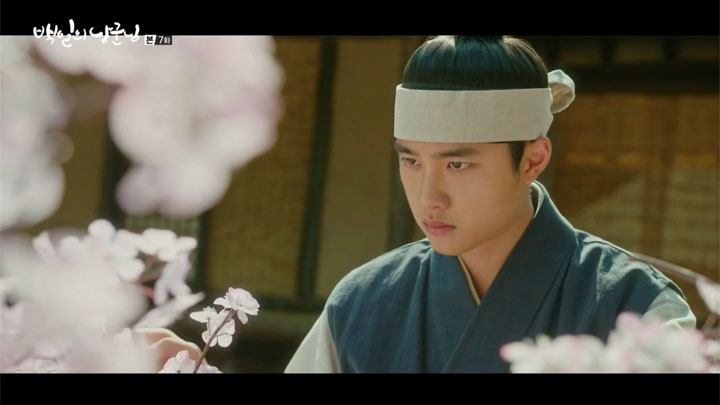 A drawing resembling Won Deuk that was dropped by a performance troupe had his men follow the lead to Songjoo Village where Won Deuk is spotted buying Hong Shim a pear of plum blossom embroidered silk shoes. Seok Ha is led to the barley fields where Won Deuk has arranged to meet his sister. As Seok Ha prepares to shoot his arrow at Won Deuk, his sister comes into view. 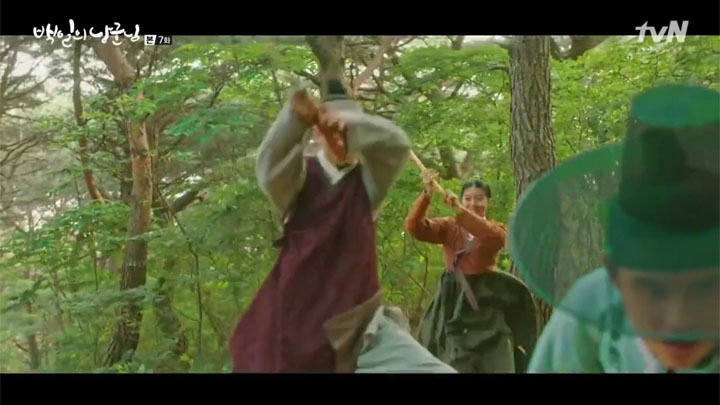 It looks like he hasn’t spotted her as his arrow is released and flying right for Won Deuk (or will it hit Hong Shim?!) We’ll find out next episode. This should complicate things for Seok Ha. 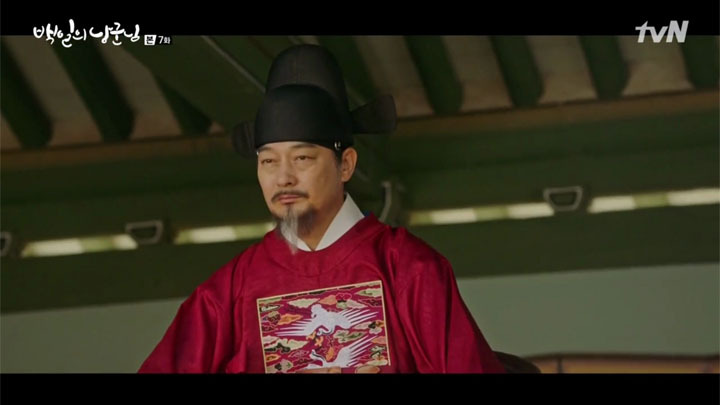 He’s yet to know Hong Shim’s husband is the Crown Prince he’s ordered to kill!